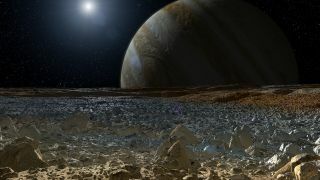 An artist's conception of what the surface of Europa might look like. Four scientists made the case yesterday (Aug. 1) to a panel of senators that Congress should continue to fund NASA's search for life beyond Earth. Only one of those scientists was affiliated directly with NASA, and the hearing touched on a broader range of scientific priorities for the agency and how to balance those with a limited budget. After opening statements, the hearing began with subcommittee chair Sen. Ted Cruz asking the panel flat out why we should search for life on other worlds. Other panelists echoed the emphasis on symbolism and inspiration rather than science directly. Sara Seager, a planetary scientist at the Massachusetts Institute of Technology, pointed out that most of the current senior researchers came of age during the moon landings. "Today, the equivalent of that is the search for life, and that public search and when we do discover it will inspire that next generation to go into technology," she said. But she was also careful to point to more-tangible benefits that could come from searching for life, regardless of whether we ever find it. She didn't promise specific technologies, but asserted that the scientific research would inevitably lead to benefits not yet expected. "It takes a ton of pure science research to come up with anything practical, things you could never invent if you set out to find something practical," Seager said, pointing to GPS technology, which began as a way to track satellites and was only later used for ground navigation, as an example. That emphasis on spin-off technology was a clear theme in the hearing, with senators pushing the scientists to explain how searching for life on other worlds could benefit humans on Earth. Meanwhile, the scientists offered an economic justification for the search as well as an intellectual one. "When we try to do things that are really hard, like we did at the time of Apollo, when you push yourself to answer the really tough questions, that's when you really push technology forward," Ellen Stofan, director of the Smithsonian National Air and Space Museum and former chief scientist at NASA, said. "I would argue that when you push technology forward, you push your society forward, you push the economy forward." The panel also tried to convince the senators that the United States, specifically, is in a position to tackle the search for life and to welcome that search. "Thanks to decades of NASA spacecraft missions, we know how to take the next steps in the search for life at Europa, Enceladus and of course Mars, and eventually Titan," Stofan said. Even admitting that such technology was still in the works, Seager emphasized that NASA is on track to develop those tools and shouldn't be distracted from that effort. She was talking about technologies meant to help scientists find what she called "a true Earth twin," a planet with a bright sun and an environment like our own. While most of the hearing's conversation focused on microbial life, the discussion did touch briefly on technologically advanced civilizations beyond our solar system. Senator Gary Peters of Michigan referenced the theoretical possibility of billion-year-old civilizations and asked whether we are even searching for life in the right way. Stofan elegantly directed the conversation back to exoplanet science and surveying our own neighborhood first. And, of course, the James Webb Space Telescope showed up in the discussion, with senators expressing the usual horror at the instrument's cost overruns and launch delays. The scientists all made the case, however, that the telescope was worth it.